This past weekend I got the chance to run with Team Nuun at the Ragnar Trail Relay at McDowell Mountain Park, which is just northeast of Phoenix. In the process, I got to meet some awesome runners, bust out some miles on some of the most picturesque trails I've ever been on, and share my love of Nuun with everyone that stopped by our tent! The race began at 12pm on Friday and went through the night and late into the next day. 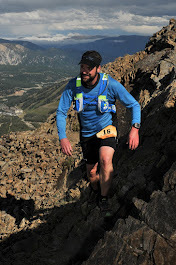 Teams of 4 (ultra-teams) or 8 runners set off to complete the 132 mile trek. Each teams predicted pace determined their starting time, so while the race started at noon, my team didn't set off till 4pm. Each runner was required to run each of the 3 legs. Each leg was a different distance and each had their own challenges. The green leg was 4.6 miles, the yellow was 4.3, and the red was 7.6...for a total of 16.5 miles per runner. The order in which you ran your legs was determined by your team assignment. As runner 1, I ran my legs in the following order: green-red-yellow. As I came into the transition area, I handed off our timing bib to Megan, who was running the 2nd leg. Megan is a member of the Nuun staff who, among other things, was responsible for managing the Nuun tent during the event. She also was the one that organized our team. Megan works closely with the Ragnar staff and attends many of their races throughout the year to run the Nuun tent as well as participate in some of the races. Needless to say, her hard work was very much appreciated by not only our teammates and I, but all the race participants as well. 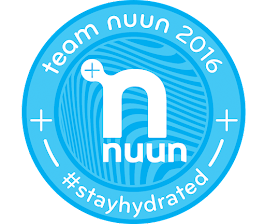 I can't tell you how many times I heard a runner tell her throughout the race weekend how much Nuun had saved them. Day turned to night, but I still had a few hours to kill before my next leg. A pasta dinner was provided by Ragnar and I took full advantage of it. I ate a couple hours before my leg so it had some time to digest. The beer garden had also opened and as tempting as it was to grab a cold one, I stuck with my water and Nuun. Beer could wait until the finish. After my leg, I chatted with a couple of my teammates, Sean and Kristina, near the bonfire the Ragnar crew built. Sean was runner 8, so he was the one that exchanged the bib with me when he would finish his legs. We discussed how Kristina would come wake me up in the morning when it was my turn to run. They then headed off to their tent for some shuteye. I stuck around the bonfire for a little while longer before heading to my tent to get some sleep as well. I wasn't expecting to sleep much during the night, but as soon as put my head down, I was out until I heard Kristina calling my name to tell me Sean was on course. I collected my running gear and performed some minor acrobats to climb over my teammates, Caitlin and Sarah, that were sharing the tent with me. I was surprised to find it was still dark out. I was expecting to run my third leg at sunrise, but we were running much faster than expected. I spent most the morning helping out at the Nuun tent and hanging with my teammates. I ordered a breakfast burrito from a food truck and drank copious amounts of coffee. It didn't take long for it heat up and judging by the looks on some runners faces, I was glad I didn't have to run anymore. Our team continued to crush it on the course and before I knew it, Sean was preparing for his and our team's final leg. Shortly before setting off, Sean removed his running shorts to reveal some rather stylish Superman undies, complete with a cape. He was also wearing Superman socks (which also had capes). He would go on later to say, "You can't take running too seriously." I can't agree more. My teammates and I awaited his arrival and when he came into view, we cheered loudly and joined him to run across the finish line together. It was an awesome way to end an amazing race. Afterwards, we all received our finisher medals and posed for a team photo in front of the Ragnar truck. Everyone did an absolutely stellar job! We completed the 132 mile course in under 21 hours! This was my first Ragnar event and I had a blast. Running is all about camaraderie and there was certainly plenty of this within our team. I was honored to be part of such a fun group and I look forward to possibility of running with them again!